It is time to break a promise. Every guest to this wonderful place of culinary restistance had to swear a holy oath: Not to tell tourists about the ‘Carmagnole’. And I get it, you know? If if ‘tout le monde’ knew just how good they are … it would ruin this place for you. It is a rather small place and you would always want to be able to get a table here. But it was impossible for this kitchen, these drinks, this concept and this atmosphere to stay a secret. So, there you have it: the Carmagnole is no secret anymore. And I cannot watch you, dear tourists, suffer anymore by the somewhat underwhelming gastronomy landscape that is the ‘Schanze’, settling for a sub-par Portugese or Italian meal. No more! I want to see you smile! So, dress sharp, bring cash (no CC) and either be on time (18:00) or make a reservation and have a “French with a twist” experience in this, our formerly secret bistro. If it is warm, the nice folks of the Carmagnole will pull out their vintage blue tables on the terrace. If not, you will enter through the bar. Ahh, they take their bar very seriously, and so should you! An aperitif is a ‘must’ here. There is also Kronenbourg and Leffe on tap and a very good wine list. 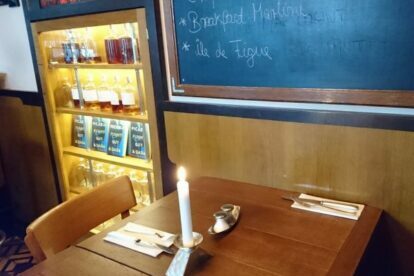 The menu gives you very well-done French classics plus the daily/weekly specials. All good, all worth their price. You want to swear that oath now?